Action Performance Companies Inc., the leader in the design, promotion, marketing and distribution of licensed motorsports merchandise, today will announce details surrounding a race-day collaboration between Universal recording artists 3 Doors Down and Dale Earnhardt Jr.
On Friday, May 27, during the Food Lion Speed Street celebration in Charlotte, N.C., 3 Doors Down will unveil the No. 8 Budweiser/3 Doors Down 2005 Chevrolet Monte Carlo. The car features a 3 Doors Down paint scheme and will be among this year's Chevrolet contenders in the Chevy Rock & Roll 400 night race at Richmond International Raceway on Saturday, Sept. 10, 2005. 3 Doors Down will appear on the Budweiser Stage at Speed Street for the special presentation at 7 p.m. The band will return to the Budweiser Stage at approximately 10 p.m. for a late-night concert. This is the second time that the band is appearing on a stock car affiliated with Earnhardt Jr. In August 2003, 3 Doors Down was the subject of a paint scheme on the No. 8 Chevrolet fielded by Chance 2 Motorsports, the team co-owned by Teresa Earnhardt and Dale Jr. Tony Stewart drove the car at Michigan International Speedway and dominated the event. He nearly took the No. 8 3 Doors Down Chevrolet to victory lane before rain cut the day short, leaving him just out of the top 10 in 11th place. Action Performance designed the No. 8 Budweiser/3 Doors Down Chevrolet, which features added black accents over a metallic red paint finish. The car includes official 3 Doors Down band logos as well as the Budweiser "True Music" insignia. Action also will produce limited edition die-cast replicas of the car, which will include the special paint finish. The No. 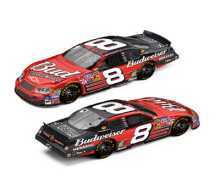 8 Budweiser/3 Doors Down Chevrolet Monte Carlo will be available in select Action die-cast scales. "Over the years, the September night race at Richmond International Raceway has become a fan favorite," said Fred Wagenhals, the chairman, president and CEO of Action Performance Companies. "This year, it will be another rockin� night in Richmond, and Dale Jr.�s No. 8 Budweiser/3 Doors Down Chevrolet surely will give fans another reason to watch and cheer. For 'True' collectors, the die-cast replica will be the next great addition to their Dale Earnhardt Jr. collections." Die-cast sales for Dale Jr.'s No. 8 Budweiser/3 Doors Down 2005 Chevrolet Monte Carlo will be handled in Action's usual settings, including the Action Racing Collectables distributor network and the RCCA collector club. To locate an ARC distributor, please call 1-800-411-8404. To join RCCA, the only source for Elite� series die-cast, call 1-800-952-0708 or visit www.goracing.com. To locate an ARC products dealer, use the online locator tool at www.action-performance.com. Food Lion Speed Street is an annual event that precedes NASCAR's longest race, the Coca-Cola 600. This year, Food Lion Speed Street is slated for May 26-28, 2005 and runs along Charlotte's Tryon St. (between Stonewall St. and 7th St.). After selling 12 million albums since their debut in 2000, 3 Doors Down released their third studio album, SEVENTEEN DAYS (Republic/Universal) in February 2005. The album features 12 original songs, including the road weary ballad Landing In London, which features Bob Seger. The record's first single, Let Me Go, was released to rock radio in December 2004 and is already a Top 10 hit on most rock stations nationwide. The corresponding video for Let Me Go was added to national formats and features young actors Jodi Lyn O'Keefe (Boston Legal) and Jesse Metcalfe (Desperate Housewives). No stranger to hit singles, 3 Doors Down have had six No. 1 singles � Kryptonite, Duck & Run, Loser, Be Like That, When I'm Gone and Here Without You, making them one of the most popular and consistently successful rock bands in recent history. According to Billboard Magazine, they were the first debut act to ever have had a No. 1 single at four different radio formats simultaneously with Kryptonite, and the quintet went on to win the 2003 Billboard Music Awards for "Best Pop/Rock Group" and "Best Hot 100 Single," as well as earning the distinction of seeing When I�m Gone become the most played song in 2003 according to the Nielson Vegas for Artist of the Year: Modern AC Radio. In the past four years, 3 Doors Down have moved from accomplishment to accomplishment, establishing themselves as an exceptional band, both in the studio and on stage. From Escatawpa, Miss., 3 Doors Down is Brad Arnold, lead vocals; Matt Roberts, guitar; Todd Harrell, bass and Chris Henderson, guitar.